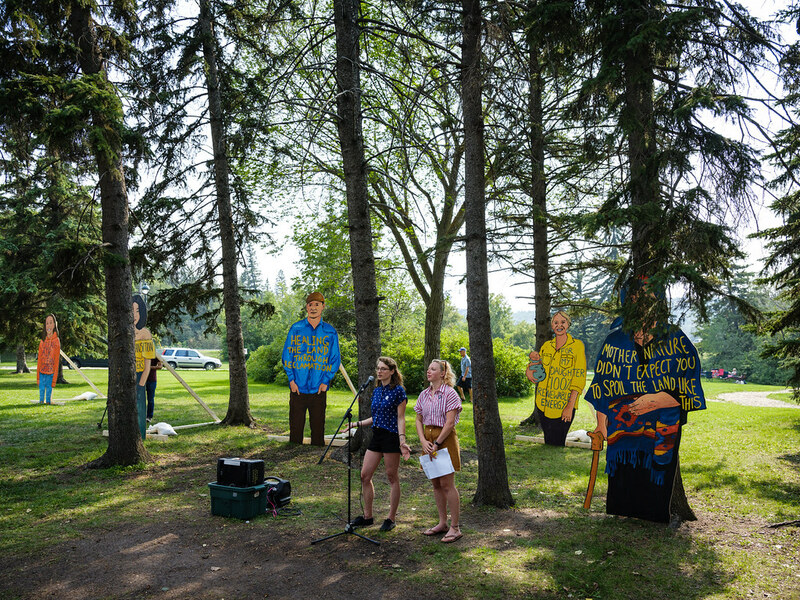 Climate Justice Edmonton's anti-TMX land art project People on the Path, August 2018. Photo by Abdul Malik. The Intergovernmental Panel on Climate Change’s (IPCC) recently released special report can be summed up as: “it’s worse than we thought, and we’re doing less than we promised.” This isn’t new – it has been the crux of every international climate report we’ve had since the UN started working on them in 1988. But as we get closer to our planetary tipping points, the implications are becoming much more existential. To have a decent chance at staying below global warming of 1.5ºC, we will need to cut our emissions in half in the next 12 years. But the most important takeaway of this recent report is that reaching this emissions target is not impossible. We have the solutions. We have many roadmaps for a fair transition on this timeline, but to get there we will need to multiply the people power pushing for them. As in any crisis, there are many people pushing false solutions in the hopes of turning a profit. For example, fossil fuel companies have been pushing carbon capture and storage (CCS) technologies to justify their continued expansion, but the technology is unproven and more expensive than almost any other way to reduce our emissions. Likewise, electric vehicles are part of the solution, but so is the harder and less-talked about work of building affordable, comprehensive public transport systems. Does it support or put power in the hands of people who are the most marginalized? There are no shortcuts in social movements either – we cannot solely rely on flash-in-the-pan petitions and rallies. We need to make sure we also have a deeper organizing strategy that includes being out talking to people at their doorsteps, parks, and workplaces, building strong coalitions beyond the climate movement, and taking leadership from grassroots efforts. It’s often clear the climate movement is saying no to new fossil fuel projects, but less clear what we are saying yes to. We have to get better at communicating our vision for the future and getting buy-in from all pockets of our communities. There are already roadmaps for a just transition – try the Solutions Project, Sustainable Dialogues Canada, Gordon Laxer’s reports on tar sands phase-out, or Tony Clarke's Getting to Zero if you’re interested in reading more. There are also many inspiring levers to get onto these pathways, from the groundswell of Indigenous-led efforts to block new fossil fuel projects discussed above, to community-owned renewable energy projects, to postal workers using their union to push for the postal service to become the hub of the next economy and everything in between. But the exact solutions and the strategies for a just transition look different in different places. And much of the push for a just transition will need to come at the local level. There are more and more inspiring examples of organizers building powerful coalitions that unite health care, labour, Indigenous rights, anti-racism, feminist, and other advocates in envisioning and pushing for a just transition in their regions. Two examples of these bold, intersectional coalitions that we’ve been excited to help build are the Nova Scotia 2030 Network, the Northwest Territories’ Common Front who have put forward locally-relevant and irresistable visions for fast and fair transitions in their homes. Another inspiring example is the coalition in Washington State that appears almost set to pass the closest legislation to a Green New Deal that we’ve seen yet in North America. The central challenge of climate change is that those who are the most impacted are also the least positioned to avert it. Against these odds, communities on the front lines of extreme fossil fuel extraction and climate impacts are leading the way – from pushing for the science-based 1.5ºC target in the first place, to blocking new fossil fuel projects, to building community-owned renewable energy projects. Taking a “nothing about us without us” approach to climate change means taking leadership from these frontline communities and showing up to support them, both locally and in the Global South where the impacts of climate change are set to hit the hardest. We are living in an unprecedented and emotionally fraught time. It’s full of possibility and peril. Climate change anxiety is a valid and logical response, and so is anxiety around racism, the creeping rise of fascism, ongoing colonialism, and the other overlapping crises we face. But even though it can be easier to disengage than to lean into making change, in order to build a new, fairer, renewable society, we need to be able to channel our emotions into actions. We need to process this grief. We need to somehow move through it, and our best chance for doing that is moving through it together. There is less out there on climate anxiety than I'd like, but this article from Grist lists some resources, as does this YES Magazine guide on building communities of care. It can also be helpful to remember that climate change is not a zero-sum game, so even if 1.5C seems impossible to you (it’s not!) the science is pretty clear in saying every fraction of a degree of warming we prevent will still tip the balance towards a safer and fairer future.